How to choose the right system and how to implement it. At the risk of stating the obvious, your business management system is critical to the success of your business. Without it, you will be flying blind. But, what happens when you need to make a change to your business management system? How can you change out the system that monitors the status and health of your business without causing disruptions to your business? Well, that is what we are addressing in our new article series – Project Success: how to choose the right system, and how to implement it. Your business management system is comprised of all the methods, tools and processes you and your employees use to get information about your business so that you can manage your business. It probably includes yellow pads, sticky notes, clipboards, electronic spreadsheets and many other manual processes, in addition to your electronic accounting system. In our experience, many companies might say, “Oh, you mean my accounting (or my ERP – Enterprise Resource Planning) software.” While that is part of it, your accounting or ERP software is only part of the equation. You have systems that may or may not include software. We want you to think about every system that you have in your company so that you can make sure that you are considering all the requirements you and your staff have for a business management system. Many times we find that while the accounting system records data on the current quantity of inventory items on hand, there are one or more other systems that track where the product is located, how it is stored, what has passed inspection, what lots are in stock, what lots were shipped to each customer, what products to combine into kits and so on. So, we might say it this way, your business management system is the corporate legend (the part where you ask Jim or Mary about something), yellow pads, bound notebooks hanging from a string, clipboards, rolodex, 3×5 cards, paper filing cabinets and the software you use, like spreadsheets, parcel shipping software, warehouse management software, manufacturing and shop floor control software and your accounting or ERP systems. Then there is the people part of your system. They are the ones who really make things work. And, we haven’t talked about the most difficult to define – your sales system – which includes all of the manual methods plus contact management or CRM (Customer Relationship Management) software. If you are considering adding to, or completely changing your ERP system: STOP. We’ve been called in to fix more failed implementations than we care to remember, and we’ve seen first-hand the devastating effect this can have on a company. We want to help you succeed with your business management system, and hope you’ll read the upcoming article series in our newsletter. 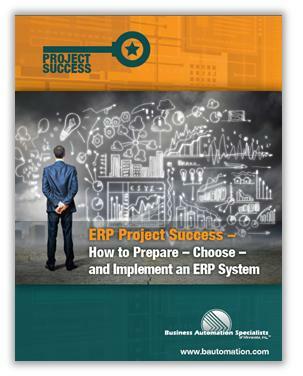 However, you may also receive the complete ERP Project Success eBook, via download above!